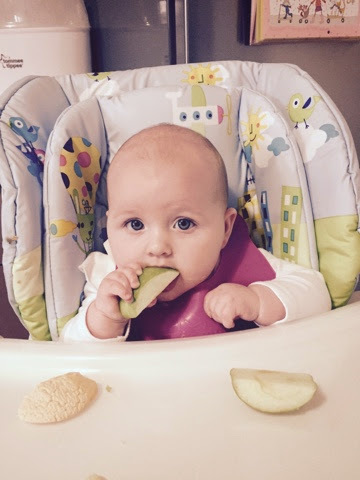 Baby Pebbles: BLW: What I ate Sunday! Breakfast, Lunch & Dinner! BLW: What I ate Sunday! Breakfast, Lunch & Dinner! Today for breakfast I had toast with mashed banana! I liked it so much I sucked the toast till it was sopping wet and gooey. I could tell mum really enjoyed the clean up. 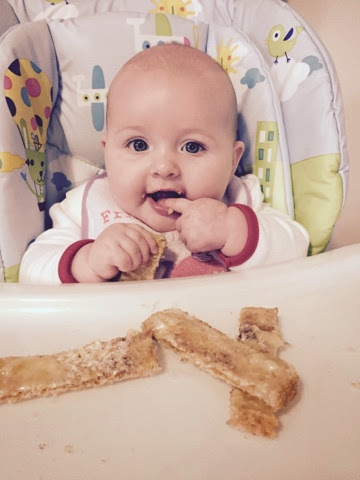 Today for lunch I had Apple wedges, half a rusk and some pear purée! Today's lunch was a good mix of flavours. Exploring was so much fun that I kept getting bursts of excitement! Although obviously I am not eating the food as such. I like to taste it all and take in tiny amounts as I'm only learning. Mummy says I'm doing great and gives me lots of encouragement! Daddy gave me lunch today, I kept him on the edge of his seat as I had a few gagging moments which daddy isn't used too! 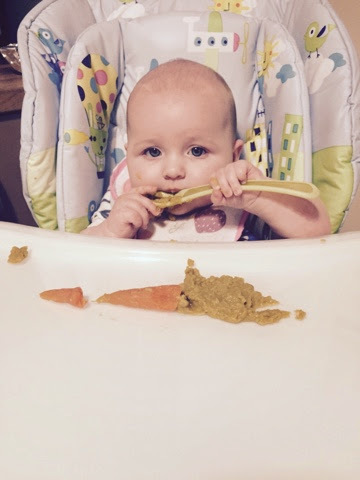 And lastly for dinner I had steamed carrots for finger food with homemade carrot and pea purée. I loved the pea and carrot purée but the carrots on their own ergh, I just kept spitting those out. I'm not too keen! I even went to put a few spoons in my own mouth. Okay not with much food on it but I knew exactly what to do. I licked all the peas off it! Nom nom!